Store Closings: Retailers See Rapid Shakeup As Consumer Habits Change Nine U.S. chains have filed for bankruptcy this year. Store closures are accelerating, and 89,000 retail jobs have been lost since October. "The disruption is just unfolding," a former executive says. 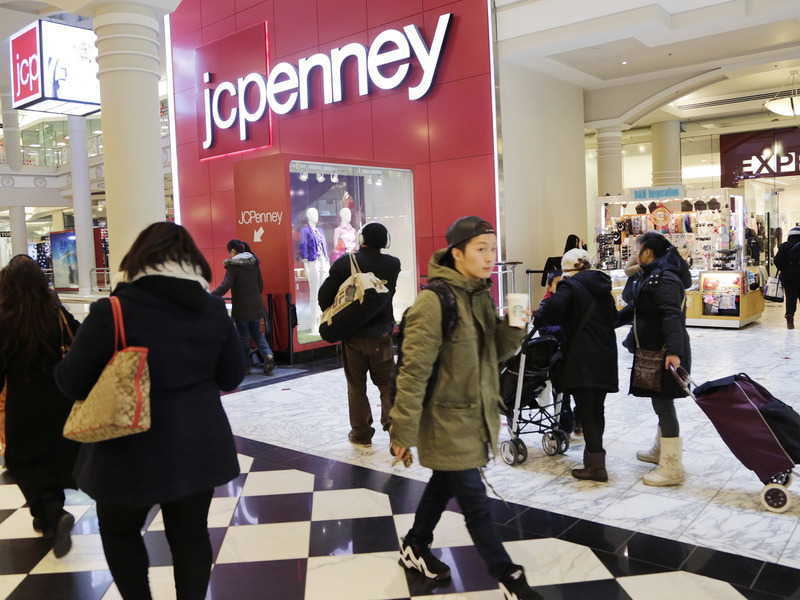 J.C. Penney is among several chains that have announced plans to close stores this year. With unemployment low and economic growth expected to bounce back from a slow first quarter, consumers are not in bad shape. But it has been an especially terrible year so far for retailers. Nine U.S. chains have filed for Chapter 11 bankruptcy protection. Store closures are accelerating, and almost 90,000 retail workers have lost their jobs since October. Experts say the industry's troubles are just beginning. "The disruption is just unfolding," says Mark Cohen, a former CEO of Sears Canada who now directs retail studies at Columbia Business School. "I think the number of store closings will continue at an accelerated pace right through this year into next year." It's not that consumers are being more cautious. Spending is up, but most of that growth is online. Traditional brick-and-mortar stores are grappling with intense transformation of their business to be more Web-based and trying to reconcile their old business model with one in which profit margins are thinner. Cohen says retailers typically reassess their businesses after the holiday shopping numbers come in and adjust by closing or reallocating resources. For some big national chains this year, that process is resulting in a bloodbath. The Limited, BCBG Max Azria and Radio Shack filed for bankruptcy. Retailers have announced plans to close 3,100 stores so far in 2017 — more than all of last year combined. J.C. Penney said it would close an additional 138 stores this year, Sears and its Kmart brand intend to close 150 stores, and Macy's will shut down 100 stores. There are 1,200 malls in the U.S. — the most ever, according to the International Council of Shopping Centers. Experts agree there is simply too much real estate devoted to retail. Cohen says all but the best-performing malls — which make up roughly a third of those enclosed malls — will have to close or find a new identity. In fact, many are being redeveloped to include office space, apartments, gyms or smaller retail space. "It's not clear what we're going to look like on the other side when this is all over, if it in fact is ever all over," Cohen says. Retail is transforming to an "experience economy" featuring stores where customers try things and then order them online, Christopher Leinberger, chair of the Center for Real Estate and Urban Analysis at George Washington University, tells NPR's Robert Siegel. "It's certainly not the end of retail. Retail always transforms," Leinberger says. "This is a much bigger transformation than we've had in 50, 60 years. The previous big transformation ... was from walkable urban in the early 20th century — the Main Streets — to regional malls. Well, we're going back now to the 21st century version of Main Street... ."
Matthew Shay, CEO of the National Retail Federation, says historically, changes in retail have happened slowly. Not so today. "The velocity of change is unlike anything we've ever seen," he says. "Before, things happened over a generation; now they're happening overnight." Shay says retail's workforce needs are shifting, which is why the trade group launched a program offering certification to laid-off workers in January, hoping to retrain them with higher-level skills that are in demand. "They'll be in operations; they'll be in warehousing; they'll be in store management; they'll be in digital," he says. Marshal Cohen (no relation to Mark Cohen), chief retail analyst for The NPD Group, says brick-and-mortar stores aren't just competing with rivals; their sales are being cannibalized by their own online operations, where profit margins are thinner. Some retailers, like Bonobos and Warby Parker, that started online are opening stores as showrooms, places where consumers can test their products and then order online. Marshal Cohen says those types of showrooms require a lot less space than a conventional store. The velocity of change is unlike anything we've ever seen. Before, things happened over a generation; now they're happening overnight. Another big change, he says, is that social media have usurped the mall as the gathering place of choice. Malls are trying to counteract that by building more restaurants and movie theaters, to create places where people want to come to interact. "We are entering an interesting phase of consumption," Marshal Cohen says. "We're not interested in buying products. What we are doing is building memories." Some analysts believe some of those who lose their jobs at retail will be absorbed by a growing service sector, like restaurants. But one of the unions that represent some workers says that is not happening. "That has not been our experience. That's not what we've seen," says Stuart Appelbaum, president of the Retail, Wholesale and Department Store Union. The retail jobs of the future might be in a distribution center, but he says those jobs are typically far away from metropolitan areas where more stores are located and require different types of skills than those of, say, a cashier. "There is a lot of stress in being a retail worker today," Appelbaum says. "You worry about e-commerce, you worry about automation, you worry about what's happening with all the retail jobs that are being lost as stores close." Politicians speak about how to manage job dislocation in coal mining and manufacturing. Now, Appelbaum says, it's time to do the same for retail.